This is a shorter post today as we have been on the go quite a bit and working on a number of new posts for you. 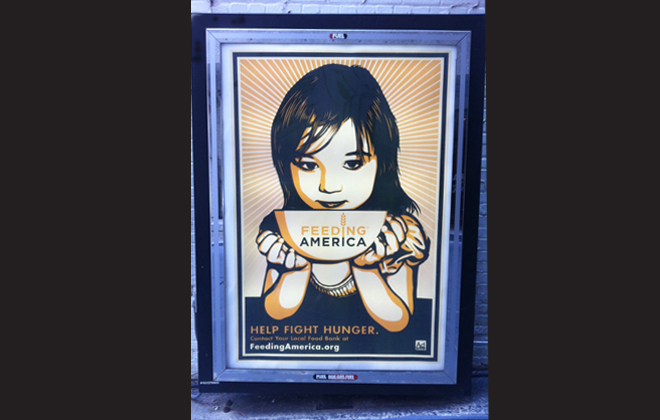 Last week in Chicago, I was leaving a parking garage before running errands and saw this amazing poster for a charity I have long believed in called Feeding America. It caught my eye for a number of reasons and it made me think. How rare it is to see such a striking illustrative advertisement these days! I love illustration. Always have, always will. It is just not something I see enough of these days. I had to quickly snap a picture and then investigate who designed this poster. Turns out, it was the same contemporary artist, Shepard Fairey, the creator of the Obama “Hope” posters that we all saw during his first campaign for presidency. Once I embarked on this illustration trail, I found another amazing pair of artists that caught my eye and I will share with you in one of my next posts. These London artists are about to have their first West Coast solo exhibition. Until then, if this post inspires you to learn more about or to give to Feeding America, please do so by visiting their website here.